Give your company the competitive edge by delivering up-to-date, pertinent business reports to users inside and outside your enterprise. 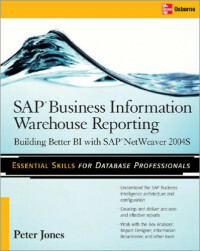 SAP Business Information Warehouse Reporting shows you how to construct Enterprise Data Warehouses, create workbooks and queries, analyze and format results, and supply meaningful reports. Learn how to use the BEx and Web Analyzers, Web Application Designer, Visual Composer, and Information Broadcaster. You will also find out how to forecast future business trends, build enterprise portals and websites, and tune performance. Peter Jones is a platinum consultant at SAP Training/Business Consulting with more than nine years of consulting and educational experience. He regularly speaks at SAP-sponsored events.